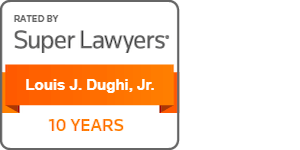 Louis John Dughi, Jr. - Dughi, Hewit & Domalewski, P.C. HomeAbout Our FirmAttorneysPartnersLouis John Dughi, Jr.
A founding partner of Dughi, Hewit & Domalewski, P.C. Louis John Dughi, Jr. is one of the leading defense trial attorneys in New Jersey. Mr. Dughi’s practice includes medical and hospital malpractice and pharmaceutical litigation. He has tried over 250 cases on behalf of physicians and product manufacturers in state and federal courts. Mr. Dughi is retained to counsel insurance, pharmaceutical and manufacturing companies and other law firms in negotiating difficult settlements and preparing trial strategies. He has counseled hospitals, physicians and other healthcare professional involved in licensing and hospital privilege disputes and fraud investigations, and appeared before the Board of Medical Examiners, and hospital hearing committees representing hospitals or physicians. Mr. Dughi frequently lectures lawyers and client groups on current legal trends respecting civil litigation, settlement strategies and ADR. Mr. Dughi received a Bachelor of Arts Degree in British History from Cornell University’ 69 and a Juris Doctor from the Cornell Law School’ 72. 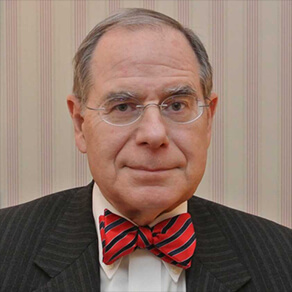 He began his legal practice at Shanley & Fisher (now Drinker Biddle) in 1972 leaving the firm in 1979 to form Dughi & Hewit with Russell L. Hewit in Westfield, NJ before moving to Cranford, NJ in 1986. In 1983 the firm opened a second office in Mt. Laurel, NJ which operated through 2007 giving him the opportunity to try cases in all but one county in the state. Mr. Dughi was a faculty member of the New Jersey Trial Advocacy College and a lecturer on trial techniques for the Institute of Continuing Legal Education. He is a Member of the American Board of Trial Attorneys and a member of the Defense Research Institute. Active in community and charitable organizations, he serves as a member of the Board of Trustees of the Kent Place School, The Ocean Medical Center Foundation Board and is a former Alumni President and member of the Board of Trustees of Blair Academy. He is married to Virginia Kiss Dughi; they have three children, Christopher Polek, David Polek and Christina Tonzola and five grandchildren. He is a lifelong resident of Westfield NJ.